“Moreton Bay People – The Complete Collection” has now been reprinted in hard copy by Boolarong Press. 2. To purchase by direct deposit. Collected throughout the last decade of the twentieth century, these reminiscences of ‘Moreton Bay People’ provide a unique insight into the lifestyle of the Moreton Bay area during a particular time frame of history – the twentieth century. Never again will we see a lazaret for lepers at Peel Island, a prison at St Helena, or a whaling station at Tangalooma. Hopefully, too, ‘The Bay’ will never experience another World War with its influx of foreign servicemen, or another Great Depression and its casualties seeking refuge in the bay’s islands. Between 1990 and 2000 author, Peter Ludlow, interviewed over eighty of the bay’s ‘personalities’ and then published their stories in a series of volumes entitled ‘Moreton Bay People’. 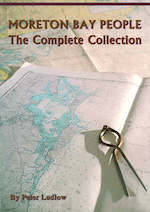 Here, for the first time, they are all brought together in a single volume: “Moreton Bay People – The Complete Collection”. With its enhanced images, full indexation, and some more previously unpublished ‘gems’ this completely re-edited edition will prove essential reading to anyone – be they reference librarians or ‘boaties’ – with an interest in Moreton Bay and its people. Here’s the full table of contents. As you can see, the monographs have been grouped into geographic areas of Moreton Bay, beginning with Bribie in the North and ending with the Gold Coast in the South. The Camp At The One Mile – Lance Watts Jnr.